A new climate strategy report by the city of Boston calls for microgrid development in several neighborhoods to avert power outages and promote low-carbon energy. A product of the city’s year-long climate study, the report gauges the impact of climate change and proposes ways to increase resiliency. “The city should pursue community energy solutions, such as district energy systems or microgrids, that increase energy reliability and decrease greenhouse gas emissions,” said the final report of Climate Ready Boston. 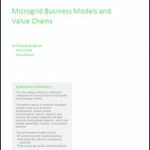 Issued Friday, the report recommends that priority be given to microgrids that serve clusters of affordable housing or critical facilities. It pinpoints specific locations that could benefit from the technology. Since 1991, the city has experienced 21 events that triggered federal or state disaster declarations, according to the report. And city officials see more coming. Boston’s harbor and rivers – natural resources that helped Boston become New England’s economic powerhouse — now make it vulnerable to climate change. The source of $160 billion in annual economic output, Boston faces economic losses of $137 million annually from 2030-2050 due to flooding. The figure rises to $1.39 billion annually after 2070, according to the report. Boston will be home to Microgrid 2017, the defining industry event of the year, sponsored by Microgrid Knowledge, the International District Energy Association and the Microgrid Resources Coalition. The report called for development of decentralized energy – specifically microgrids, district energy, energy storage and local generation – as one of 11 strategies to prepare for the risks of climate change. By islanding from the central grid during power outages, microgrids can keep electricity flowing to designated areas. Microgrids also offer climate-friendly alternative supply when the grid is operating normally, since they typically use renewable or highly efficient generation, such as combined heat and power. Under the climate plan, Boston will focus on energy justice and emergency microgrid sites. Energy justice microgrids tend to serve clusters of affordable housing, while emergency microgrids serve critical facilities, like hospitals and police stations. The Boston Planning & Development Agency (BPDA), which was previously the Boston Redevelopment Authority, has identified 42 potential sites for decentralized energy. The sites underwent preliminary engineering and cost-benefit studies. 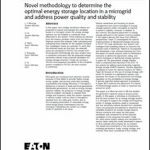 The new report pinpoints specific streets, facilities and neighborhoods for microgrids. These include the Raymond L. Flynn Marine Park Microgrid, a pilot that the BPDA is working on with local utility Eversource in South Boston. The area is significantly exposed to coastal and stormwater flooding. The report also identifies the need for microgrid development in Central Square, Charlestown, Charles River, Dorchester, the Main Street corridor, the North End, Roxbury, and areas of East Broadway near Emerson Street, Massachusetts Avenue, along Tremont Street, and at Public Alley 706. Charlestown’s Main Street corridor offers a possible location for an emergency microgrid, based on its concentration of critical facilities. An area near Sullivan Square could benefit from an energy justice microgrid. Both areas face the threat of coastal flooding. Four sites in the Charles River neighborhoods, home to Fenway Park and Northeastern University, were identified for emergency microgrids because of the many critical facilities in the area. Dorchester has five areas with a concentration of critical facilities that may be suitable for emergency microgrids. These sites are at the intersection of Gallivan Boulevard and Neponset Avenue, Fields Corner, Codman Square Four Corners/Geneva, and along Blue Hill Avenue. Gallivan Boulevard and Fields Corner are particularly vulnerable to extensive stormwater flooding in the near term. The North End offers a potential location for an emergency microgrid to serve several critical facilities. Central Square, too, has a concentration of critical facilities, so may be ripe for microgrid development. A high probability of coastal flooding threatens the area in the near term, as well as stormwater flooding. 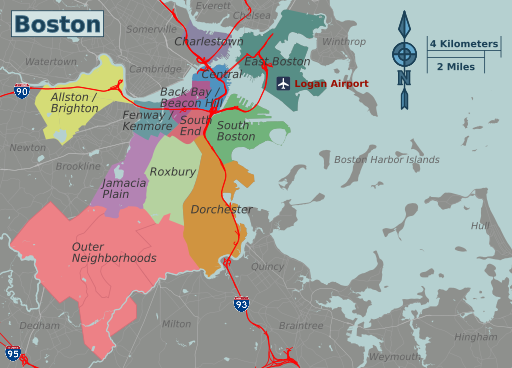 The report also recommended expansion of the existing solar power capacity at Logan Airport, which has high solar generation potential. East Broadway near Emerson Street offers potential for an emergency microgrid, based on its concentration of critical facilities. Three possible energy justice or emergency microgrid sites exist along Massachusetts Avenue, along Tremont Street, and at Public Alley 706. 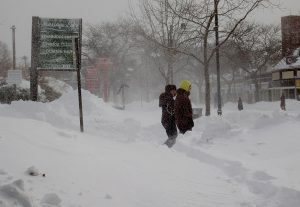 The city also plans to expand its climate strategies beyond the neighborhoods to work with bordering communities “because climate change knows no borders,” Walsh said. In addition to microgrid development, the report identified 10 other climate strategies. They include regular climate forecasts, education, worker training for climate adaptation jobs, building retrofits, and greater use of green infrastructure to manage stormwater and mitigate heat. Marcy Reed, president of National Grid Massachusetts, praised Walsh for leading the climate study. She called the report a solid roadmap for the city to get its arms around the impact of climate change. The utility provides natural gas to the Boston area. “Energy delivery infrastructure is foundational for the health and wellbeing of the communities we serve, and therefore this work is critical. Receiving the most current information regarding climate projections so we can continue to plan accordingly is extremely important for us,” Reed said. Track microgrid development worldwide by subscribing to the free Microgrid Knowledge newsletter. Any work being done or information available on microgrids for rural settings like small towns in western Massachusetts? We are trying to create a community-owned solar in my town, Wendell, MA. Combining solar generation and storage is appealing in areas like Wendell frequently hit with grid power outages during storms.